Question: As a Jewish woman raised in a nonobservant household I am attracted to Orthodox Judaism. However, I must say that I am repelled by Orthodox views on women’s roles. I’ve tried to be a homemaker but as an intellectual and spiritual person I find that being with my children 24/7, cleaning for Passover, and cooking for Shabbos are not very satisfying. I’ve always been hurt and offended when I attend Orthodox events and see there isn’t even a partition set up for women for most prayers because they’re all in the kitchen. I don’t like to cook, I’m a lousy housekeeper, and although I love my children to distraction I find I need a lot of peace and quiet in order to keep my brains about me. Instead, I love prayer and study. I feel like an Orthodox man trapped in a woman’s body! Do you have any suggestions as to how I could proceed? Answer: I received your question regarding women and their role in Judaism. I understand your frustrations. It is not really possible to properly address this complex issue in one written response so I will limit myself to a few thoughts that you may find helpful. Being an Orthodox woman who was educated in the Orthodox system, I can tell you that I was given a very good education that was both spiritually and intellectually stimulating. The Orthodox girls’ school system is very focused on producing Jewish women with an extensive understanding of the spiritual and intellectual depth of Judaism. That being said, there is much that needs to be understood concerning the woman’s role; specifically their increased involvement in housekeeping, cooking and domestic matters and less involvement in the Synagogue. The question has been asked: where is the focal point of Jewish life? Is it in the Synagogue? The true answer is surprising. Judaism could last for a while without Synagogues, but it can not last without the Jewish home. Clearly the most central location in Judaism is not the Synagogue; it is the Jewish home. It is the Jewish home where Jewish life is practiced in all its glory. The goal of the Jewish Homemaker is to create a round-the-clock center for Torah and Gemilus Chesed (Helping others). The person who is most responsible for the day to day activities in this center is the woman of the home. Her unique talents and capabilities make her particularly qualified for this task. And if this lofty mission takes a bit away from involvement in the Synagogue, it is a small price to pay. I know many Jewish women who are not great cooks and their housekeeping is not spectacular but their home is a beautiful one. One specific woman comes to mind. She doesn’t cook very much. She cooks the “basics”; her home is simple. She made her home, together with her family, one that is filled with guests and a place where one feels secure and happy. It is a center for Judaism. Our goal is to transform our home into a Mikdash Me’at (a small sanctuary). In the Beit Hamikdash (our Holy Temple) the spirituality was centered around burning flour, meat and incense…...some cooking on a grander scale. Yes, it probably was easier to feel the spirituality when doing the service in the Holy Temple. However, with the right understanding and focus feeling spiritual can be accomplished. I hope some of the ideas above could help bring some clarity to a very complex issue.I would be happy to discuss this with to you further. The Home is central to Jewish practice and values. Ask most Jews about their strongest Jewish memories, and they will speak of Passover Seders at their grandparents’ house, lighting Chanukah candles with their parents, or eating Shabbat and holiday meals with their families. Though the importance of synagogues and other Jewish institutions cannot be minimized, the home remains the place where most people first encounter Jewish ritual, and where much of Jewish life takes place. It is perhaps a function of the Diaspora experience that the home has assumed a central role in Jewish religious life. Lacking, for most of Jewish history, a national homeland, Jews have instead focused on creating holy space within their own personal dwellings. judaism at homeA Jewish home can be identified both by the objects in the home and by what takes place there. While individual families differ in their religious practice and Jewish interests, certain elements link Jewish homes to one another–and to other Jewish homes throughout history. One prominent symbol is the mezuzah, a box-encased scroll that serves as a literal acting out of the biblical command to “write these words on the doorposts of your house and on your gates” (Deuteronomy 11:20). Other examples include: ritual items–such as candlesticks, kiddush cups (with which to say the blessing on wine sanctifying Shabbat and holidays), and special plates for the challah loaves–and books on Jewish subjects or by Jewish authors. These objects help outsiders identify the house as Jewish and remind the inhabitants of the house of the centrality of Judaism in their home life. The kitchen–or wherever meals are served–not only becomes the center of family life, but also assumes a ritual function. According to the Talmud , “When the Temple stood, the altar offered atonement. Now, one’s table offers atonement” (Tractate Chagigah 27a). In other words, during the period when the Temple stood in Jerusalem, the primary means of divine worship involved offering sacrifices on the altar. Today, the primary means of divine worship involves having meals at home. Blessings before and after the meal, ritual foods, and family participation transform eating from a mundane activity into a religious experience. Because the kitchen has traditionally been the women’s domain, much of Jewish women’s spirituality has historically revolved around what goes on in this space. While certain areas of religious life–notably the synagogue and the beit midrash (house of study)–were once the sole domain of men, kitchen ritual remained in the hands of women. Women controlled the kashrut (observance of the dietary laws) of the home and determined the family traditions associated with the kitchen. Tehines, Yiddish prayers composed by or for women in the 16th through 19th centuries, include many prayers specific to the home, including meditations on baking challah and on lighting Shabbat candles. In speaking to God, women invoked the private spaces of the home. In addition to holiday and Shabbat meals, certain lifecycle rituals take place in the home. The brit milah (circumcision) and simchat bat (welcoming ceremony for baby girls), which welcome a new child into the Jewish community, traditionally take place in the home, though space constraints often force these events into the synagogue. Placing these rituals in the home emphasizes that the child’s first and primary Jewish community will be his or her family, and that the home will continue to be the center of his or her Jewish life. 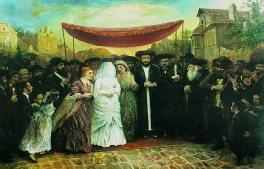 While weddings do not ordinarily take place in the home, the huppah (canopy), a primary feature of the Jewish wedding ceremony, symbolizes the home that the couple will build together. In getting married under a huppah, the couple emphasizes their commitment to building a Jewish home together. The explicit identification of the home as the center of Jewish life seems to be a relatively recent phenomenon. Early rabbinic sources speak often of public spaces, such as the beit midrash and the synagogue, but only rarely mention the religious life of the home. While there is much discussion of legal issues relevant to the home, such as kashrut, marital relations, and blessings over food, there is little talk of the home as a concept in and of itself. The Talmud contains numerous stories of rabbis who spend years studying away from home, sometimes to the point that they no longer recognize their own children. To the talmudic emphasis on the beit midrash as the center of Jewish life, later legal sources add a focus on other communal institutions, such as guilds and local governing bodies. To a large extent, the lack of discussion about the home may be attributed to the fact that the home–in contrast to the beit midrash and the synagogue–was a primarily female space. As women’s voices are virtually absent from early Jewish writings, we can only guess at the actual place of the home in everyday Jewish life. The Jewish home is an ever-changing institution. The books on the shelves do not necessarily remain the same from one generation to the next, and the style of certain ceremonies and rituals reflects new interests and concerns. Women now play greater roles in synagogues and other traditionally male spaces, and men play greater roles in the home. Even as its precise nature changes, however, the home remains central to the practice of Judaism and to Jewish family life. The Jewish home is where core identity of young Jews is formed. And it is formed not through abstract ideas, but through concrete experiences of the five senses. The tastes, smells, sounds, and images of Jewish life are first experienced in the home–through observance of Shabbat and festivals, living a Jewish life every day, and making the home a meaningful Jewish space. Following the destruction of the Temple in Jerusalem in the year 70 C.E., the rabbis decided the home would be the mikdash m’at–“small sanctuary”–a holy place responsible for fostering the family’s spiritual life. The most prevalent symbol of a Jewish home is the mezuzah affixed to the upper portion of the right side of the door. The mezuzah is a small parchment scroll protected by a decorative case. The scroll contains two passages from Deuteronomy, 6:4-9 and 11:13-21, which comprise the first two sections of the Shema prayer. The case can be made of wood, metal, glass, plastic, or ceramic. Traditional Jewish law requires every room except the lavatory to have a mezuzah, though many families only put one on their main entranceway. An important concept in Jewish life is hiddur mitzvah, the beautification or enhancement of religious practice. In that spirit, Jewish homes are filled with ornamental ritual objects such as candlesticks, kiddush cups, hannukiyot (Hanukkah candelabras), and other items. Married couples may prominently hang their ketubah (wedding contract), which often is decorated beautifully. In modern times, a Jewish home also often includes art by Jewish or Israeli artists. Jewish families cannot live in isolation. To live a full Jewish life requires engagement with other Jews, a Jewish community. The community provides services and experiences that the home cannot, and in addition, fellowship and participation in community have inherent spiritual value in Judaism. While Jews can pray individually, the presence of a minyan (a quorum of 10 or more men, or adults) is required for certain portions of the service. Thus, the synagogue emerged as the central institution of the community. Historically, the synagogue included a beit midrash (a place for study) and often, a guest room for travelers. Many synagogues contain a mikveh (ritual bath) used for people to immerse in and also for readying new dishes and cooking utensils for use in a kosher kitchen. Today, many synagogues house religious schools for community youth, and some have gyms or swimming pools for recreation. As Jewish communities grew larger, some functions of the synagogue were transferred to separate institutions, including yeshivot or day schools, Jewish homes for the sick or elderly, and social service agencies for charity collection and distribution. Today, many of these activities and others are the function of centralized communal organizations called Federations. Federations support Jewish schools, community centers, family and counseling services, vocational services, residential services for disabled or elderly populations, and philanthropy for agencies that provide these same services to Jews in other lands and in Israel. In addition to the Federations, myriad organizations provide programs and services focused on specific issues or specific populations. These include B’nai B’rith, Hadassah, ORT, National Council of Jewish Women, Jewish War Veterans and numerous others. Providing kosher food requires bakeries, butchers, and other establishments supervised by overseers familiar with the details of both food chemistry and the laws of kashrut. Burial of the dead requires cemetery land set aside for this purpose. In most American Jewish communities, a Jewish cemetery preceded the organization of the first synagogue. But, burial is not the only issue. The body must be washed, dressed and attended prior to burial. The hevrah kadisha–burial society–attends to these needs through Jewish funeral homes. With the invention of movable type, Jewish booksellers and Jewish bookstores became a feature of the community. Today, these stores sell Jewish ritual items as well. The diversity of family life today demands that the community be prepared to not only provide those functions inherent to community, but also to fill in the gaps of Jewish home life. Jewish schools, summer camps, youth groups, and community centers all reinforce the home experiences, or in some cases, provide these experiences for the first time. The community is therefore the partner of the home in creating and perpetuating a vibrant Jewish life.